Venus appears as a black dot on the lower left edge of the sun in this image from NASA's Transition Region and Coronal Explorer (TRACE), captured during the 2004 transit. As skywatchers around the world try to catch a glimpse of the rare transit of Venus today (June 5), several satellites and astronauts in orbit will also be monitoring the historic event from space. The roughly seven-hour event will begin at around 6:03 p.m. EDT (3:03 p.m. PDT; 2203 GMT), as Venus begins crossing the face of the sun. The planet will appear as a tiny black blemish as it moves across the solar disk. Transits of Venus are some of the rarest celestial sights because they only occur in pairs eight years apart, once every 100 years or so. Today's transit is paired with a previous one that occurred on June 8, 2004. But after today, the next Venus transit will not occur again until 2117, or more than 100 years from now. Artist's conception of the Reuven Ramaty High Energy Solar Spectroscopic Imager (RHESSI). NASA's sun-watching Solar Dynamics Observatory (SDO) will be staring at the transit from space to help scientists learn more about Venus' intensely hot atmosphere. Researchers are hoping SDO's extreme ultraviolet light telescopes will unlock some of the mysteries of Venus' atmosphere, which is partially transparent at those wavelengths. SDO, which was launched in 2010, will also use its observations of the transit of Venus to fine-tune its onboard instruments, NASA officials said in a statement. Since astronomers can accurately track the timing of the various stages of the transit, SDO mission controllers can use these figures to make sure the spacecraft's images are properly positioned in relation to true solar north. These minor adjustments will help make sure SDO's orientation is accurate to within a tenth of a pixel, NASA officials said. The agency's Ramaty High Energy Solar Spectroscopic Imager, or RHESSI, will also monitor the Venus transit to improve current calculations of the exact shape and width of the sun. The sun-pointing RHESSI satellite will watch as Venus treks across the face of the sun, giving scientists measurements on the sun's so-called oblateness, which is the difference between the star's equatorial diameter and its pole-to-pole diameter. RHESSI was launched in 2002 to study solar flares by measuring the highest energy X-rays and gamma rays produced by the sun. The satellite has already collected a decade's worth of measurements of the sun's diameter. By combining these observations with ones from today's transit of Venus, and data collected from a previous Venus transit in 2004, mission managers will also be able to see if the sun's size varies throughout its 11-year solar cycle. This is an animation of Venus Express performing stellar occultation at Venus. NASA astronaut Don Pettit is aiming to become the first person to photograph the transit of Venus from space. Pettit is a member of the International Space Station's Expedition 31 crew, and is partway through a months-long stay aboard the orbiting outpost. Pettit will be taking pictures of today's transit from the space station's seven-windowed Cupola observatory, NASA officials have said. But NASA is not the only space agency hoping to capitalize on the rare astronomical event. Two European Space Agency-led missions, Venus Express and Proba-2, will be observing Venus' orbital pass between Earth and the sun. Venus Express was launched in 2005 and is currently the only spacecraft in orbit around Venus. The probe will use light from the sun to study the composition of the planet's atmosphere during the transit, according to officials from the European Space Agency (ESA). Based on how Venus' atmosphere filters sunlight that passes through it, scientists will be able to measure different concentrations of gas molecules at various altitudes, ESA officials explained. As Venus Express gazes at Venus during the transit, the European Proba-2 microsatellite, which was launched in 2009, will watch as the planet passes in front of the sun. "Proba-2 is expected to see a dip in the solar brightness as soon as the thick atmosphere of Venus makes first contact with the solar disc," Joe Zender, ESA's Proba-2 mission manager, said in a statement. The path that Venus will take as it approaches the Sun in SOHO’s field of view. 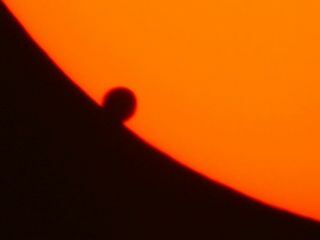 The image is from the transit of Venus in 2004, but a similar path will be taken during the transit of 2012. Japan's Hinode solar satellite, which launched into orbit in 2006, will also have a front row seat for the action. "The most spectacular images and movies should come from Hinode's Solar Optical Telescope, which has by far the highest resolution of any solar instrument in space," said Bernhard Fleck, ESA's Hinode and SOHO project scientist. "Unfortunately, SOHO [Solar and Heliospheric Observatory] will not be well placed to observe the transit. However, it has one thing that no other spacecraft can provide: views of Venus as it approaches the sun days before the actual transit, and then moves away from the sun for several days after the transit." The Hubble Space Telescopes, which is a joint venture between NASA and ESA, will use the moon as a giant mirror during the transit to measure the light that passes through Venus' atmosphere and is reflected onto the moon. This maneuver will test techniques that could one day be used to measure the atmospheres of Earth-size rocky alien planets beyond our solar system. WARNING: If you plan to observe the transit of Venus in person, it is very important to exercise caution and protect your eyes. It is very dangerous to stare directly at the sun. Special eclipse glasses or solar filters for telescopes are needed to avoid permanently damaging your eyes.